Fred. Olsen Cruise Lines was proud to work with the BBC this year to film a six-part documentary series aboard its flagship Balmoral, called 'The Cruise: A Life at Sea', which will be broadcast on BBC2 from Tuesday 9th July 2013, at 8.30pm. There is still a chance for Fred. Olsen Cruise Lines’ guests to take advantage of some very tempting cruise deals from Newcastle this Summer, from just £59 per person, per night*, as 804-guest Black Watch commences her cruise season from the Port of Tyne on 18th June 2013. Fred. 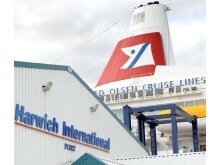 Olsen Cruise Lines’ 1,350-guest cruise ship Balmoral made her inaugural call at the Port of Galveston in the United States on 25th January 2012, during the first sector of her 89-night ‘Cruise to the New World’, which departed from Southampton on 5th January 2012.